Christ is Risen! 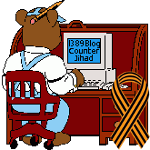 … and important Serb-related information on Ukraine — 1389 Blog - Counterjihad! A belated Happy Easter greeting and Best Wishes to all our Serb Brothers and Sisters! The CIA director was sent to Kiev to launch a military suppression of the Russian separatists in the eastern and southern portions of Ukraine, former Russian territories for the most part that were foolishly attached to the Ukraine in the early years of Soviet rule. Washington’s plan to grab Ukraine overlooked that the Russian and Russian-speaking parts of Ukraine were not likely to go along with their insertion into the EU and NATO while submitting to the persecution of Russian speaking peoples. While the “Western-oriented, anti-Soviet” Ukrainians topple statues of Lenin, it was actually Lenin, Stalin and Khrushchev who were the real “Founding Fathers” of modern Ukraine, increasing its traditional territory manifold. And their annexation of Russian lands to “Ukraine” was more than foolish. They intentionally redrew borders, created various “republics” and resettled significant numbers of people, falsely labeled “ethnicities” in their census-taking and “Ukrainanized”and “Belorussified” populations that were ONE ethnicity with Russians to conform to their version of an “internationalist union of the proletariat” and a “friendship of nations” – the more “nations”, the better for creation of a “who is next to join the bright communist future” campaign. All of this was done mostly at the expense of the largest ethnic group of the Soviet Union – Russians, which was similar to the policy of Tito towards Serbs in Yugoslavia, including his pro-Albanian policies in Kosovo. Only 60 years ago, Soviet Ukraine, under Nikita Khrushchev, annexed Russian Crimea. And it was Lenin who in the 1920-30’s arbitrarily drew the borders to give away to “Ukraine” the lands of the “Donetsk- Donbass” (Don basin) – territories of the Don Cossacks, who the Bolsheviks tried to exterminate for their support of the White Army in the Russian Civil War (and gave away other Cossack lands to Kazakhstan). The cities of Odessa, etc, in the south were never part of the traditional Malorossiya – the proper name of the Ukraine – “Borderland” but were part of Catherine the Great’s Novorossiya – Slavic lands liberated from the Turks. http://en.wikipedia.org/wiki/Novorossiya. Western Ukraine has a very tragic history. During the Russian Civil War, the Bolsheviks offered Polish leader Pilsudski to give Poland all of Western Ukraine in return for his betrayal of White Army forces under Gen. Wrangel when the Bolsheviks were already surrounded, which he did, and which resulted in the defeat of Russian anti-communist forces. This fateful betrayal was described by Polish author and Katyn massacre investigator Józef Mackiewicz in his novel “Lewa Wolna”. After 1939 these Polish-held Western territories of Ukraine – Galicia, already having suffered forced conversions to the Unia, Russophobic brainwashing, and genocide at the hands of Austro-Hungary of those that yearned for reunification with Greater Russia (the first concentration camp in Europe – Talerhof http://orthodoxengland.org.uk/pdf/talerhof.pdf ) were incorporated into the Soviet Union by Stalin. During WW II descendants of the surviving population produced their own Nazi SS troops – SS Galicia, and their own brand of Ustasha, known for genocide and their own incredible atrocities – the Nazi organization OUN/UPA under Stepan Bandera, the idol of the current neo-Nazis who overthrew the democratically elected government of Ukraine with president Yanukovich. Today, the people of Southeastern Ukraine are being threatened with extermination by the fanatical neo-Nazi radicals who have installed the illegal Junta in Kiev with NATO support. They are fighting for their Faith, culture and lives, and the front is currently Slaviansk, where Orthodox Russians and descendants of Serbs and other Slavs are heroically manning the barricades, while Russian troops stand at the border. The US, NATO, and the EU have no legitimate interests in the Ukraine. The western-backed coup was and is flat-out one hundred percent wrong. We Serbs, both those at home and those of us in the Diaspora – we do have a dog in this fight. The survival of our brethren is at stake. It’s up to us to support the pro-Russian majority in eastern and southern Ukraine, and to take every possible opportunity to explain to others why Russia is right and the US/Soros-backed putsch government in Ukraine is wrong. Use social media and use the telephone and use face-to-face conversations as much as you can.